Events, information and news about support options or accessing support. This could be family support or support from a community group or club. Due to popular demand, new versions of “Oranga Ngākau – Getting the most out of Mental Health and Addiction Services: A recovery resource for service users” and “When someone you care about has a mental health or addiction issue” are available in hard copy or by download. “Oranga Ngākau” is easy to understand and provides valuable information about what to expect from treatment in mental health and addiction services. This includes a glossary of terms used during care, as well as describing different possible scenarios when using these services for the first time. “When someone you care about has a mental health or addiction issue” is a resource for those who are supporting others. Read about the best ways for family, whānau and friends to help people close to them who are in care, as well as how to find support for themselves, should they need it. This is a specialist workshop designed for parents, family, tutors and significant others who are in close association with those teenagers who think and learn differently. There is a significant increase in the number of teens who suffer anxiety, who struggle to participate in large groups or to feel like they ‘belong’. This workshop will focus on cognitive and sensory processing differences and those who have high functioning aspergers (ASD). Using a skilled facilitator, hypothetical or real life scenarios are played out by experienced actors and then improved… shaped… altered using the input and suggestions from the audience. This will be an extremely valuable, entertaining and eye opening experience. Skylight is excited about the topics they are offering through the 2015 PD workshop series –and they hope you will be too! Below is the flyer for the first workshop “Conflict in families” being run in their training room on March 11th from 9.30am-12.30pm. To register, go to the online registration site and create a login, then book the workshop/s you are interested in attending. Also, if you are willing to forward this information to your wider networks and/or put the flyer on a notice board or in a newsletter, it would be appreciated. 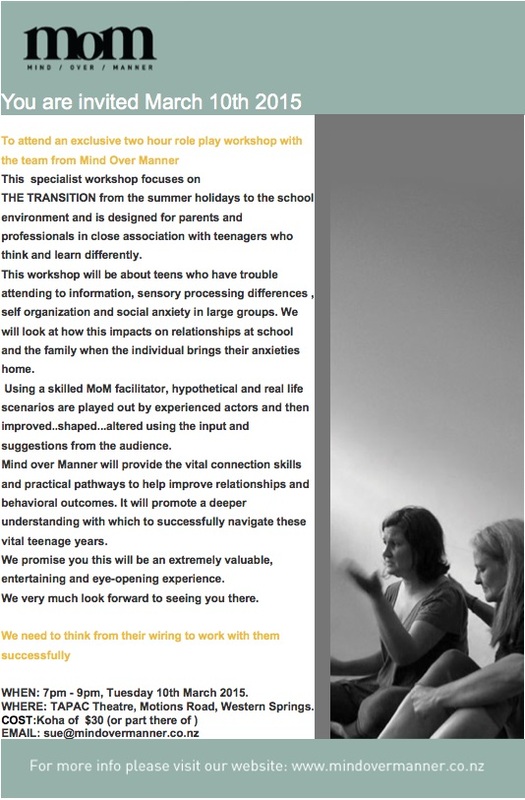 Engage Aotearoa brings you an invitation to attend an exclusive two hour role-play workshop with the team from Mind Over Manner. This specialist workshop focuses on the transition from the summer holidays to the school environment and is designed for parents and professionals in close association with teenagers who think and learn differently.